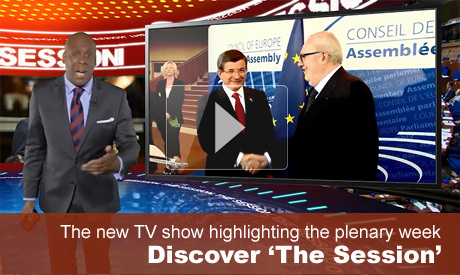 Addresses by Greek Prime Minister Alexis Tsipras and Estonian Prime Minister Taavi Rõivas were among the highlights of the summer session of the Parliamentary Assembly of the Council of Europe (PACE) which took place in Strasbourg on 20-24 June 2016. Topics for debate included the functioning of democratic institutions in Turkey, refugees at risk in Greece, violence against migrants, fighting the over-sexualisation of children, transparency and openness in European institutions, and promoting equality and putting an end to gender-based violence among women in the armed forces. Wednesday also saw a current affairs debate with the title: "Reaffirming the role of the Assembly as a pan-European forum for inter-parliamentary dialogue and co-operation". Estonian Foreign Minister and Committee of Ministers Chairperson Marina Kaljurand presented the activities of the Council of Europe's ministerial body and answered questions from parliamentarians. Council of Europe Secretary General Thorbjørn Jagland also took questions from PACE members. The Assembly elected a judge of the European Court of Human Rights in respect of the United Kingdom. On the first day of the session, PACE President Pedro Agramunt launched a Europe-wide iniative to encourage a response to terrorism founded on the theme of #NoHateNoFear.